The Right Reverend Gene Robinson, Bishop of the Episcopal Diocese of New Hampshire, will preach and celebrate mass at Trinity Cathedral in Miami on Sunday December 28 at 10:00 am. Bishop Robinson will also conduct a Cathedral Forum discussion following the service in Cathedral Hall. 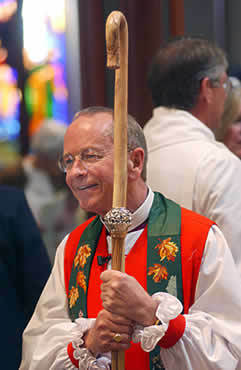 V. Gene Robinson was elected Bishop of the Episcopal Diocese of New Hampshire on June 7, 2003, having served as Canon to the Ordinary (Assistant to the Bishop) for nearly 18 years. He was consecrated a Bishop on All Saints Sunday, November 2, 2003, and was invested as the Ninth Bishop of New Hampshire on March 7, 2004. "Gene Robinson is bishop of the tiny, rural Episcopal Diocese of New Hampshire, but he's at the center of a storm of controversy raging in the Episcopal Church and throughout the worldwide Anglican Communion involving homosexuality, the priesthood, and the future of the Communion. This book offers an honest, thoughtful portrait of Robinson, the faith that has informed his life, and the controversy that continues to rock his Church." Join us this Sunday for a beautiful worship experience and a time for discussion with Bishop Robinson. Trinity Cathedral is located near the intersection of North Bayshore Drive and the Venetian Causeway in the Performing Arts / Omni section of Downtown Miami. A Christmas Eve service for the whole family, especially children! Join us for a beautiful Midnight Mass on Christmas Eve at 11 pm. Bishop Frade will preach. The Mass setting is 'Mass of the Quiet Hour' by George Oldroyd. Christmas Carols will be sung from 10:30 pm. Join us for a Christmas Day Eucharist (Communion) service with carols at 10 am.